Do you need to take your mini on the road? 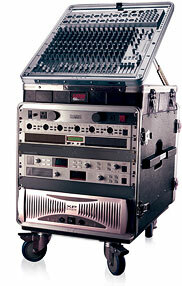 The RackMac mini is a perfect solution—its internal rubber bumpers hold your computers firmly in place, even during transport in portable racks. Combine this with a shallow 11-inch mounting depth, and you have a product perfect for use in molded cases such as those from Gator Cases. The RackMac mini mini’s design also allows normal WiFi and Bluetooth wireless operation in most configurations (depending on rack type and position in rack), so you can use iPhone® or iPad® application control apps. 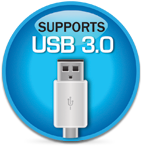 The RackMac mini includes front panel access to each Mac mini’s disc slot (if present), IR receiver, power indicator, power switch, and one USB 3.0 port. From the front panel you can turn on each Mac mini, plus connect a keyboard, mouse, USB drive, or other USB device. RackMac mini allows open access to the computers' ports in the rear of the enclosure. Holes for cable ties enable you to secure all cables, keeping them tidy while avoiding accidental disconnects. 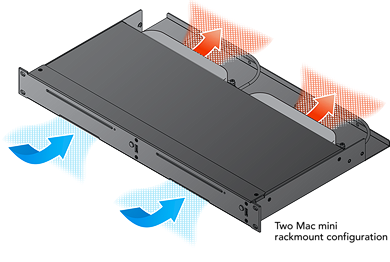 RackMac mini secures your Mac minis without trapping them in recirculating hot rack air. A strategically designed chamber directs cool air in a one-way path through front panel openings to the computers’ air intakes, and then out the back. Stay Cool. 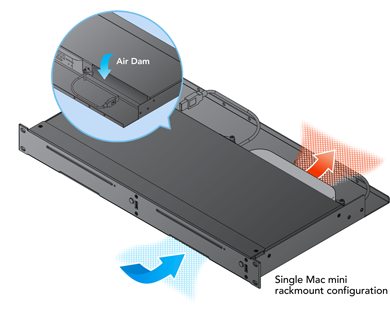 RackMac mini's design ensures that cool air goes in a one-way path through the front panel openings to the computers’ air intakes, exiting out the rear. In a single Mac mini configuration, the Sonnet solution's air dam and strategically placed seals help keep air from circulating in the unoccupied computer bay. 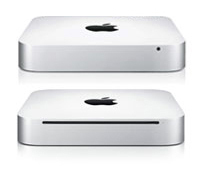 Whether you install one or two Mac minis, RackMac mini prevents recirculation of hot air around the computers to keep them ambient temperature chill and operating reliably.